Middlesbrough and Leicester played out a dull goalless draw at the Riverside to boost their respective effort to pull clear of the bottom three. In a game bereft of clear-cut chances, there were just four efforts on target throughout the whole 90 minutes. Middlesbrough wanted a penalty when Robert Huth brought down Adama Traore and Boro's Gaston Ramirez lashed the best opportunity wide from six yards. Leicester, without a Premier League away win this season compared to 11 in last term's title-winning campaign, saw Leonardo Ulloa head a corner straight at Brad Guzan. Boro move four points clear of the drop zone, while Leicester have a six-point cushion. Possibly the most interesting event at the Riverside came after the game, when Huth admitted he should have conceded a penalty. The German defender tried to get out of the way as Traore wormed his way into the area in the first half, and even though he made contact with the Boro winger, referee Bobby Madley waved away the appeals. "We got lucky," Huth told Sky Sports. Ex-Chelsea winger Pat Nevin, watching the game for BBC Radio 5 live, disagreed with Huth, saying: "There is nothing you can do as a defender. There is contact, but contact does not mean a penalty kick." The point for Boro will be a minor consolation after conceding two late goals to lose at Manchester United on Saturday. But it means they come out of the festive period with just one goal - and no wins - from three games. Only Hull City have scored fewer goals than Boro's 17 in the Premier League this season and their lack of creativity against Leicester prevented them turning a draw into a win. Left-back Friend - a first-half substitute for the injured Antonio Barragan - was often their most dangerous attacking outlet as he provided a number of dangerous crosses his team-mates failed to capitalise on. Leicester's 1-0 win over West Ham at the weekend meant they were under less pressure to pick up all the points at the Riverside. 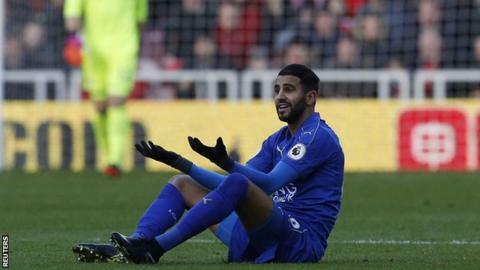 But they will now be without influential playmaker Riyad Mahrez potentially until early February, as he leaves to join the Algeria squad for the Africa Cup of Nations. Mahrez has not been at his best this season though, and in the victory over West Ham it was the combination of Marc Albrighton and Islam Slimani that proved to be the Foxes' most potent weapon. But with Slimani missing out with a fever - and himself primed for Algeria duty - and Albrighton on the bench, it is a struggle to see where Leicester's attacking thrust will come from over the next few weeks. Perhaps from Jamie Vardy, who will return from a three-match suspension to face Everton in the FA Cup on Saturday. Middlesbrough boss Aitor Karanka: "I am pleased with the players because it's two days after the tough defeat on Saturday against Manchester United. "We played against a team who won the league last season and are in the Champions League - but we were better than them. "I am happy with the performance but we could not score the goal." Leicester boss Claudio Ranieri: "I am pleased with the point because we came here looking for a minimum of one point. "We defended well and showed good spirit. We wanted to do more but it was difficult because they closed down our actions well. It is an important point to start 2017 with. "We were not lucky today. I am very, very happy." It's FA Cup third-round weekend coming up, so Leicester travel to Everton on Saturday in an all-Premier League tie, while Middlesbrough host Championship side Sheffield Wednesday on Sunday. Match ends, Middlesbrough 0, Leicester City 0. Second Half ends, Middlesbrough 0, Leicester City 0. Attempt saved. Andy King (Leicester City) header from the left side of the six yard box is saved in the top centre of the goal. Assisted by Daniel Amartey with a headed pass. Attempt missed. Leonardo Ulloa (Leicester City) header from the centre of the box is too high. Assisted by Marc Albrighton with a cross. Substitution, Middlesbrough. Grant Leadbitter replaces Adam Forshaw. Delay in match Ben Gibson (Middlesbrough) because of an injury. Fabio (Middlesbrough) wins a free kick in the defensive half. Substitution, Leicester City. Marc Albrighton replaces Nampalys Mendy. Attempt missed. Gastón Ramírez (Middlesbrough) left footed shot from the centre of the box is close, but misses to the right. Substitution, Middlesbrough. Stewart Downing replaces Adama Traoré. Corner, Middlesbrough. Conceded by Ahmed Musa. Substitution, Leicester City. Demarai Gray replaces Shinji Okazaki. Substitution, Leicester City. Ahmed Musa replaces Riyad Mahrez. Attempt saved. Leonardo Ulloa (Leicester City) header from very close range is saved in the centre of the goal. Assisted by Christian Fuchs with a cross. Corner, Leicester City. Conceded by Fabio. Attempt missed. George Friend (Middlesbrough) right footed shot from the left side of the box is high and wide to the right. Assisted by Adam Forshaw. Attempt missed. Fabio (Middlesbrough) right footed shot from outside the box misses to the left. Adama Traoré (Middlesbrough) wins a free kick in the defensive half. Attempt blocked. Riyad Mahrez (Leicester City) left footed shot from outside the box is blocked. Assisted by Leonardo Ulloa. Gastón Ramírez (Middlesbrough) wins a free kick on the left wing. Attempt missed. Andy King (Leicester City) right footed shot from outside the box is high and wide to the right. Assisted by Christian Fuchs. Attempt blocked. Gastón Ramírez (Middlesbrough) left footed shot from outside the box is blocked. Assisted by Fabio. Corner, Middlesbrough. Conceded by Christian Fuchs. Attempt saved. George Friend (Middlesbrough) left footed shot from outside the box is saved in the centre of the goal. Second Half begins Middlesbrough 0, Leicester City 0. First Half ends, Middlesbrough 0, Leicester City 0. Marten de Roon (Middlesbrough) wins a free kick in the defensive half.